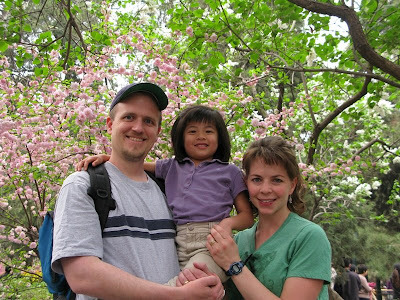 The Bredenbergs: Happy Easter from Chongqing! Sorry about the shortage of posts for the last few days. 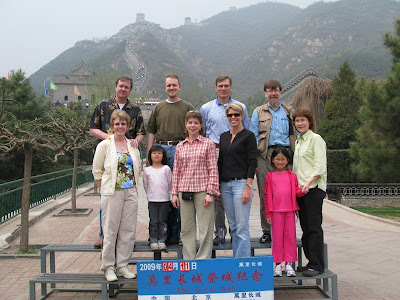 Between a lightning tour of Beijing, trying to get rested, and Sydney having a hard time with jet-lag, we haven't had much time to sit and process, let alone compose and post updates. 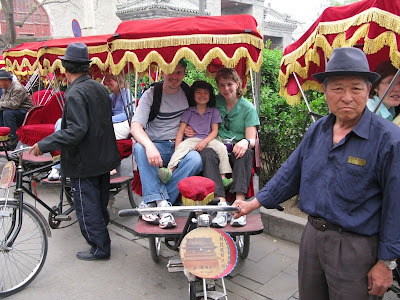 But anyway, I'll post a few photos below and you can see an overview of our time in Beijing. We anticipate getting Kate tomorrow afternoon, and we'll be posting here as soon as possible afterwards to let everyone know. Between now and then we'll be trying to get more sleep, fill out paperwork, and get all the monetary transactions lined up that have to happen to the various agencies and officials that are part of this process. Passport office, notary fees, orphanage donation, registration fees, etc, etc, etc. Health. I would love to stay healthy this time around, and I know that is entirely in God's hands. Amy's lip. She is currently having an issue where her lower lip is sore and bleeding off and on. That makes a number of things difficult, including talking, eating, interacting socially, and kissing on the kiddos. It has happened a few times in the past, but there is no way of predicting when it will end. Prayer truly seems to be the most effective medicine, as it behaves quite erratically no matter the care she takes of it. 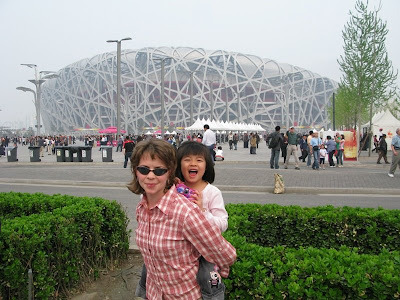 First, Amy and Sydney in front of "the bird's nest" easily recognizable from last year's Olympics. A not-so-green part of the city. 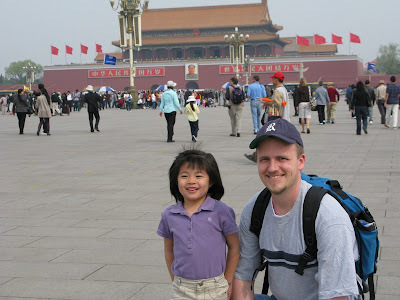 This is in Tiananmen Square, looking at the entrance to the Forbidden City and of course, Mao. thanks for the pictures and updates. We are praying for your specific requests. love you! Love your post and especially the pictures. So good to see all three of you and some of your traveling companions. Praying for better sleep and good health for each of you. Love you three! Mom/Grandma R.
We love you and are praying for all of you!